This week, I asked road warriors for their best travel tips. 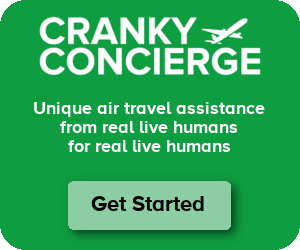 You may not realize it, but I do think a lot about how often to talk about Cranky Concierge in blog posts. It’s not easy to know exactly what to do. So let me see if I can get this straight. We get to read your blog for free. FREE. And every so often on the blog you mention that you also have a business. A service business. Related to aviation. Benefitting the very type of people who are interested in reading your blog. And some of the people reading your blog for free (not to belabor that point) raise hell about that. Really. Really? The hell with them!